Out of lemon juice or allergic to lemons? If you're working on a recipe that calls for lemon juice, one of these substitutes should work in its place. Just pick the one that seems like the best flavor match for your recipe, and you should get great results. Swap in an equal amount of lime juice or orange juice. If you're allergic to citrus, it's probably best to switch to a recipe where citrus doesn't take center stage. A vinegar-based shrub is one possibility. It would give you a similar fruitiness with an acidic edge. If the recipe just calls for a small amount of lemon juice, you might try swapping in a fresh herb that has a lemon flavor, something like lemon verbena, lemon balm or lemon thyme. Just muddle the herbs to release their flavor, and enjoy. Use an equal amount of lime juice or orange juice as a replacement. If the recipe only calls for a splash of lemon juice, replacing it with lemon extract is another possibility. The flavor is fairly concentrated, so it shouldn't take more than a tablespoon to achieve the lemony flavor that you're after. Dried or frozen lemon zest is still another possibility if you happen to have either on hand. If you're allergic to citrus, replace the lemon juice with a juice that you're not allergic to (apple juice, for example). This will change the flavor of the dish considerably but could prove to be quite delicious. When replacing the lemon juice in baked goods, be sure to replace it measure for measure, if it's more than a couple tablespoons, you don't want your recipe to turn out dry. If your recipe calls for baking soda, look to see if it includes another acidic ingredient, besides the lemon juice. If not, make sure you replace it with an acidic ingredient. It's needed to make your dough/batter rise. Buttermilk, yogurt, and vinegar are all possibilities if you're trying to avoid citrus. Replace the lemon juice called for in the recipe with an equal amount of lime or orange juice, or use half as much white vinegar or white wine. 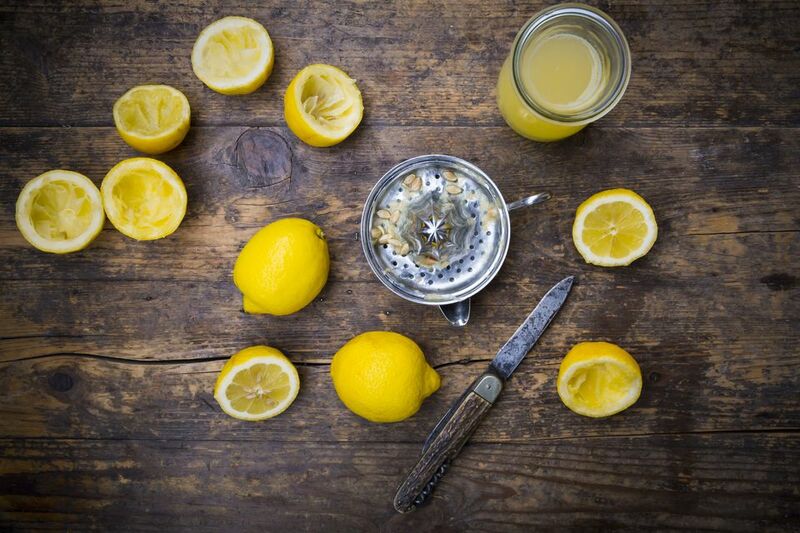 Note: Substituting vinegar or white wine for lemon juice works best in dishes where small amounts are used. Lime juice is the only safe substitute for lemon juice when you're canning, and it has to be bottled. Fresh-squeezed lemon/lime juice might not be acidic enough to eliminate the risk of botulism. Vinegar does not have a high enough acidity to be considered a suitable replacement for the lemon juice in canning recipes, so it should only be used when a recipe specifically calls for it.